The Meow folks have opened a music venue and burger bar upstairs on Manners Street. Undertheradar are calling it Wellington’s finest dive bar and music venue. At Caroline the burgers are simple (but fresh and delicious), the beers are simple (four craft on tap and a range of others by bottle), and the fittings likewise simple. However it’s taken some clever hands and eyes to make all this simple so characterful (definite shades of Mighty Mighty). And check out the Game of Thrones pinball machine! The music section is a separate hall at the back segregated by curtain – the size venue that’s been missing in the Wellington music scene for a while – and will host a wide range of alternative, travelling and start-up musicians and bands. Keep an eye on their Facebook page to see what’s coming. But even if the music’s not for you, its an easy spot to pop by for a burger and beer, with lots of glass making it feel open and light. And enough nooks and crannies that you could have a quiet conversation if you wanted. 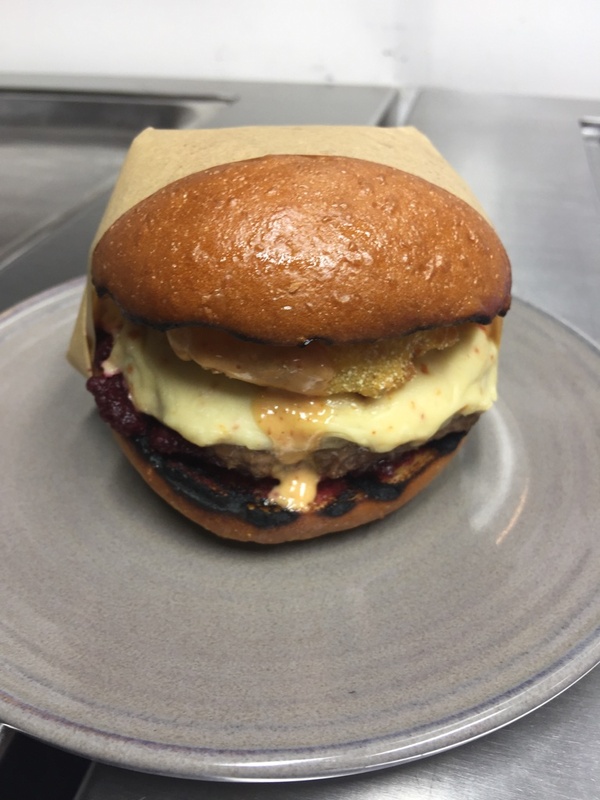 The burgers are between $7 and $13, including a haloumi with pineapple, a happy chicken (again with the pineapple), a classic fresh ground beef with artisan cheese (yay, no pineapple! ), and an ‘old school’ (yep back to the pineapple, but also a little beetroot this time). The buns are brioche, so the burgers are light, and the fillings were fresh. And yes, I’ll admit it, the pineapple does add a lovely burst of sweetness. You can also get a green salad, coleslaw, or other sides such as salt and pepper squid rings, hot chicken nibbles or cheesy broccoli croquettes. Nothing is over $13, which is darned fine value for central city eating. The beers on tap last Friday were Parrot Dog pilsner, Mussel Inn golden goose, Cassels and Sons IPA and Dales APA. The golden goose was suitably light and gentle for the useless drinker of the household (yours truly) and went well with the haloumi burger. Open Tuesday through Saturday 11am to 1am. 1 Manners Street, first floor. I’m not sure I’d previously noticed a final cook-off to determine the Burger Welly winners each year after the public eating and voting is done. Apparently over 9,000 WOAP eaters voted this year, which gave the top 5 for each of the best burger and best burger/beer match competitions (the beer match using any of co-founder Garage Project’s beers, with some brewed just for the competition). I was invited along to Le Cordon Bleu last night to see the cook-off in action, with the three judges being Chef Francis Motta of LCB, Davey McDonald from Ortega Fish Shack (on behalf of Garage Project) and Tara Nyström (who won the public competition to be the third judge). The most important thing (other than who won) is that the finalists are all encouraged to continue producing their burgers for the next couple of weeks if possible, so keep an eye on all of the below venues for more opportunities. The Laundry for the matching competition with their Smoke Jerk Chicken Burger and Red Zeppelin beer (pink lemonade and red pilsner influences). The judges said both were excellent on their own, but enhanced each other together. Egmont Street Eatery for the burger alone with their Cheese, Beets and Meat. 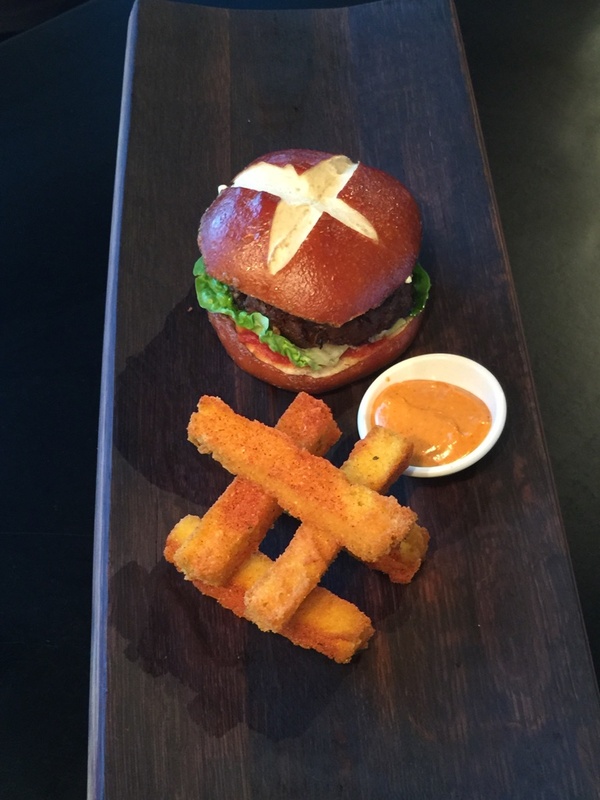 The judges said they liked that it was a traditional burger, but done with a Kiwi smoky twist. In no particular order, the finalists were…. Arborist Rooftop Bar and Eatery with their Ba Ba Baaa Ba Ba Bar Lamb burger. They started from the Garagista big hoppy beer and chose big meaty flavours to go with it, including pickled cucumber to cut through some of the richness. And those parmesan fries were damned fine. Charley Noble (last year’s champion burger) with their Ebisu fish burger. 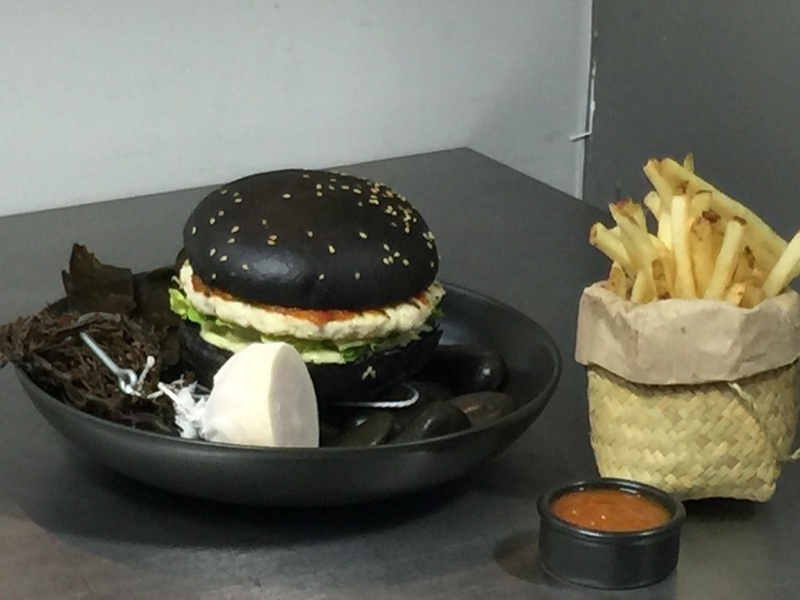 This one was about showcasing Japanese flavours alongside the smoky fish, inside a squid ink bun. Egmont Street Eatery with their Cheese, Beets and Meat beef burger. They’ve house blended three cheeses, smoked their own beetroot relish and pickled their own onions. 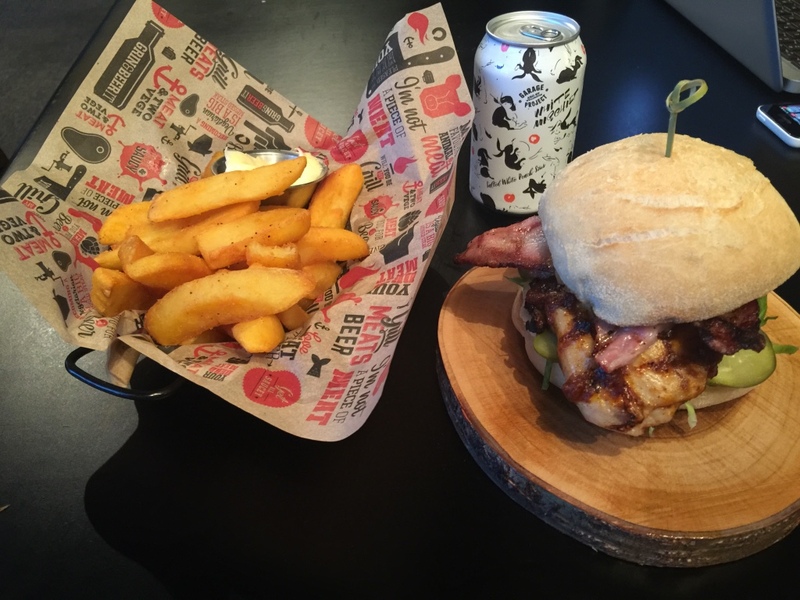 Grill Meats Beer with their Chook N Swine, Fire N Spice chicken and bacon burger with chilli fries. The secret ingredient being Mamia’s hot Ethiopian relish from a local Kilbirnie lass. Matched with GP’s White Mischief salted white peach soured beer (I can vouch for the beer, delicious – any leftover stock may be available at the brewery shop). 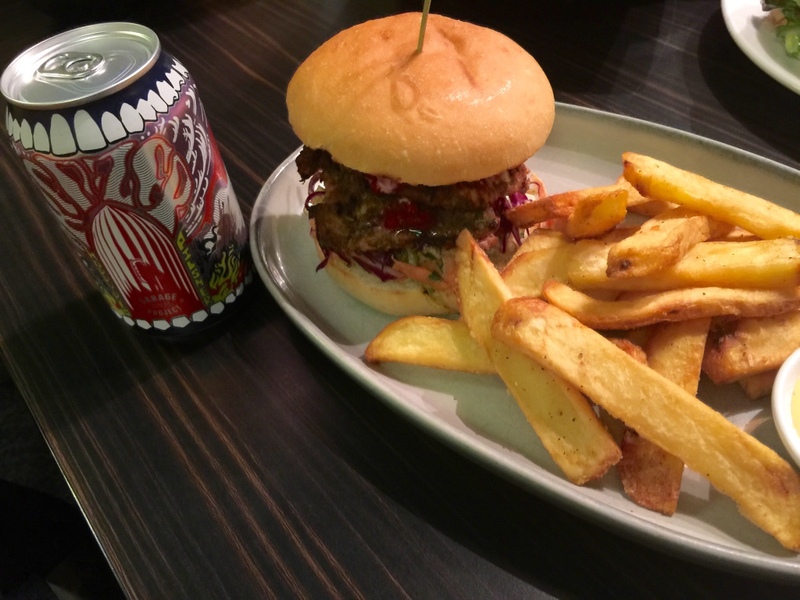 The Laundry with their Smoke Jerk Chicken burger and Red Zeppelin beer. Layered chicken fillets and smoked chicken remoulade with crunchy slaw out of a caravan kitchen. I believe there’s a little tamarillo flavour lurking around in there too. 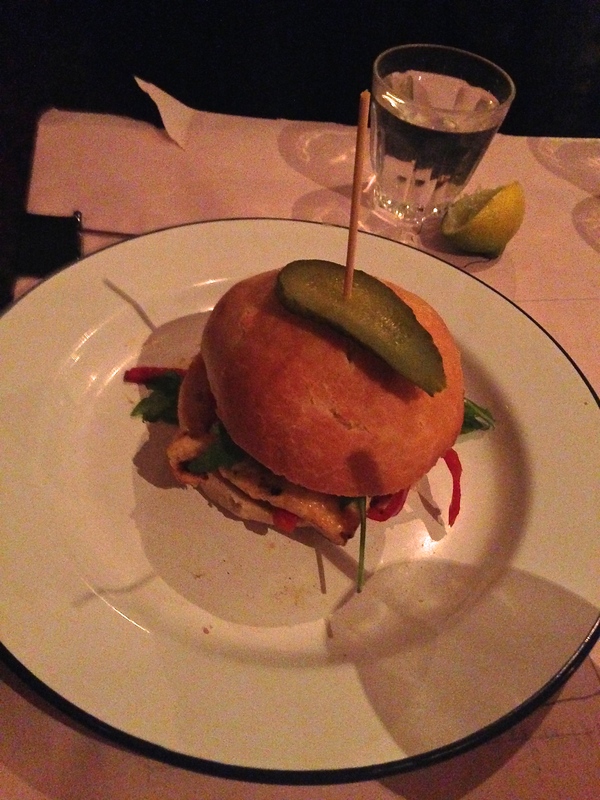 Five Boroughs’ Some Sort of (venison) Burger. The name inspired by a review in the past where one friend talked about how much her friend had liked ‘some sort of burger’ at 5B. 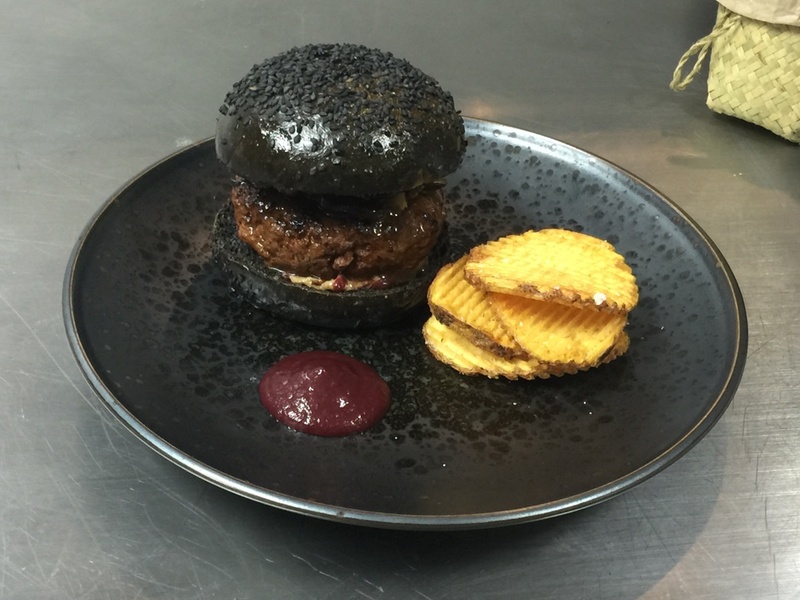 Includes foraged wild blackberries against wild venison with truffled cheese and again, squid ink buns. Cafe Medici’s (last year’s burger beer match winner) Smokey and the Lambit burger. 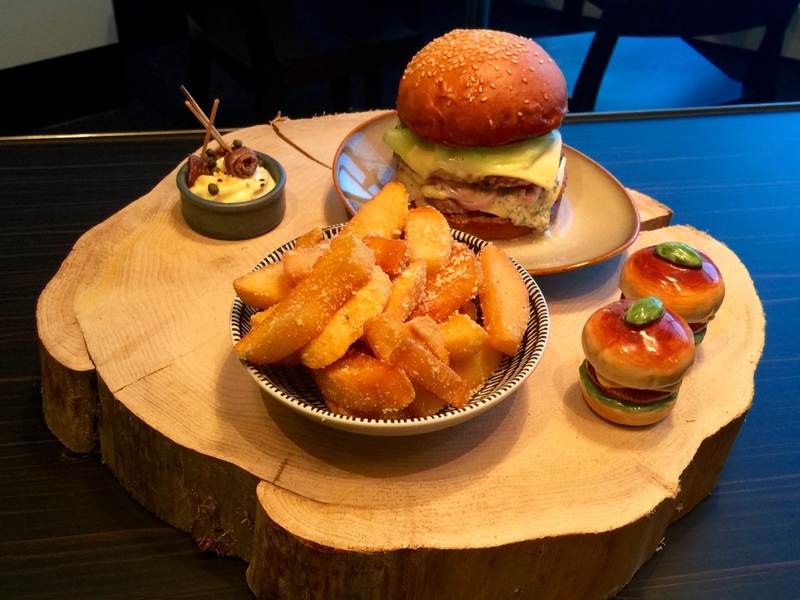 Using all local Wairarapa ingredients including pinot jelly and Claireville Bakery buns, the lamb burger was paired with crisp polenta fries which looked pretty darned fine. 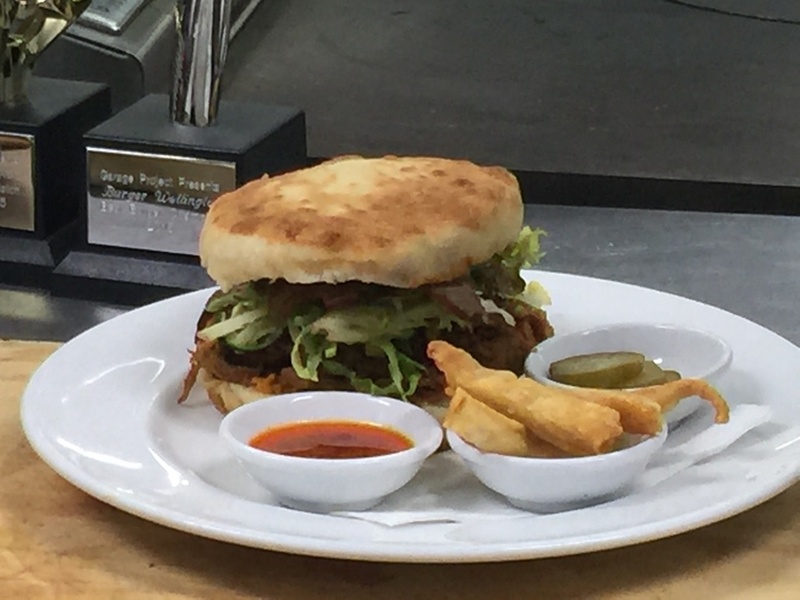 Ti Kouka’s Apocalypse Now Longbush pork burger. Again big flavours designed to complement GP’s Death from Above beer, including ginger ale bacon, a dab of bbq bourbon glaze, Asian lime and coriander, Japanese chilli oil, pickles and a side of crackling. NOTE: The Firetruck is now the Flying Dutchman. Check here for a list of current trucks. 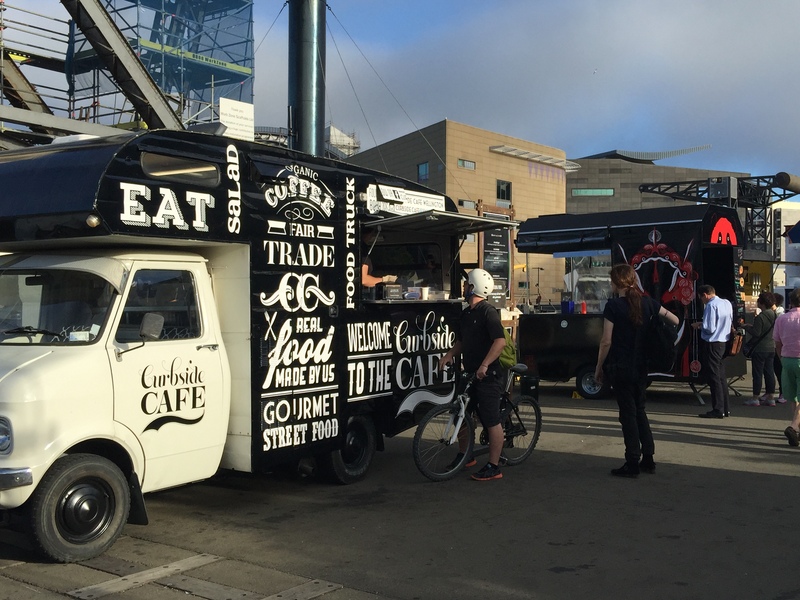 We’re starting to get a few food trucks kicking around Wellington these days, and a small collection of them can be found at The Taranaki Wharf on Thursday afternoons and evenings (and a few on Wednesdays and Fridays). Go in the afternoon if you also want to check out the crafty stalls in the baby containers dotted around. If the previous year’s form continues and the weather gods permit, this will be a weekly event right through until the end of March, so there’s plenty of time left to get yourself down there and sample the wares. 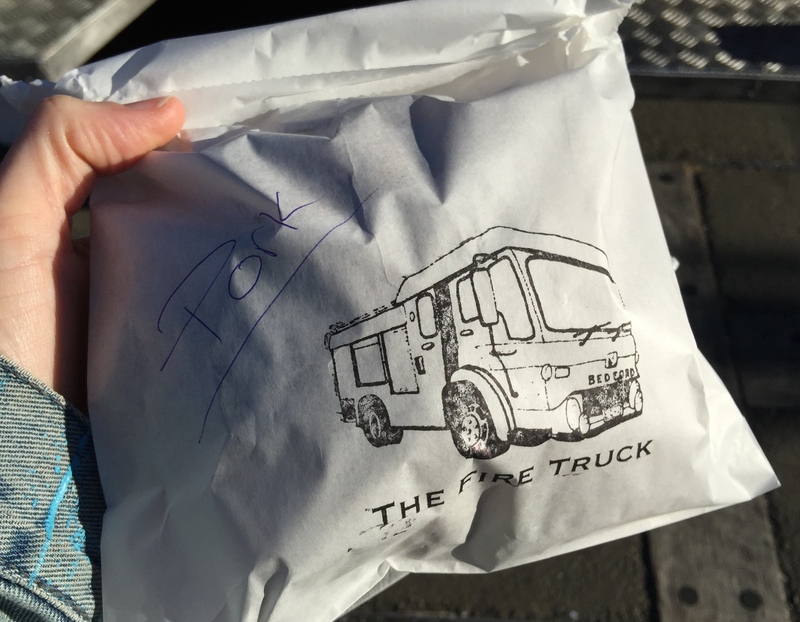 This week’s collection included The Greek Food Truck (souvlaki, haloumi and greek sausages), The Firetruck (smokey BBQ burgers), Curbside Café (lots of sliders), Nicce Chilean (hotdogs and empanadas), the Sichuan Spice trailer (street noodles and dumplings) and Santos Churros (for dessert). I couldn’t go past The Firetruck’s BBQ pulled pork shoulder on brioche bun with fennel and bacon slaw, and chipotle mayo. Good smokiness without being overpowering and a pleasant mix of soft and crunchy on the tongue. It was also pleasing to see them supporting other local artisans with Wooden Spoons’ ice cream sandwiches for afters (I can vouch for these from past experience!). I think Wellingtonians should get out there and support the food trucks as they add a fun aspect to our cityscape, allow you to try many things in one location, and acknowledge the chance these brave souls are taking in trying to get this mobile industry into gear (pun intended). For next week I’m eyeing up those street noodles …. Are we there yet on the burgers? Apparently not. On Willis Street in the old Crazy Horse Steakhouse premises is the new Burger Liquor. I’m a bit disturbed by the word Liquor in a food outlet title, but after having been along I can understand a bit more of what they’re about. 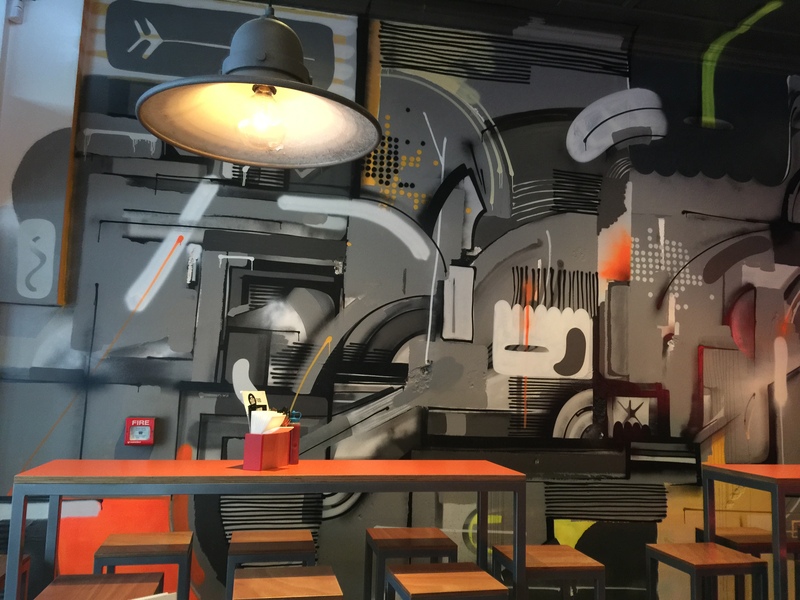 The décor, like Five Boroughs of last week, is a bit graffiti’d and edgy (industrial funk popped into my head, although I have no clue what that really means! ), they specialize in burgers, rums and bourbons (a different bourbon showcased each day), they have the requisite American snacks and sides (bread and butter pickles, onion rings, buffalo wings, etc) and they were reasonably busy on an early Saturday evening (off to a good start then). The quinoa, faro, goats cheese, spinach and beet relish burger was tasty (with a pleasing balance of textures in the crispy-exteriored, soft-interiored brioche buns), and the smokey ground chuck and short rib with streaky bacon, onion rings, nim jam and scarmoza also got a tick. The comment from the smokey burger eater when comparing here versus Five Boroughs was that these burgers are more complex. Okay then. 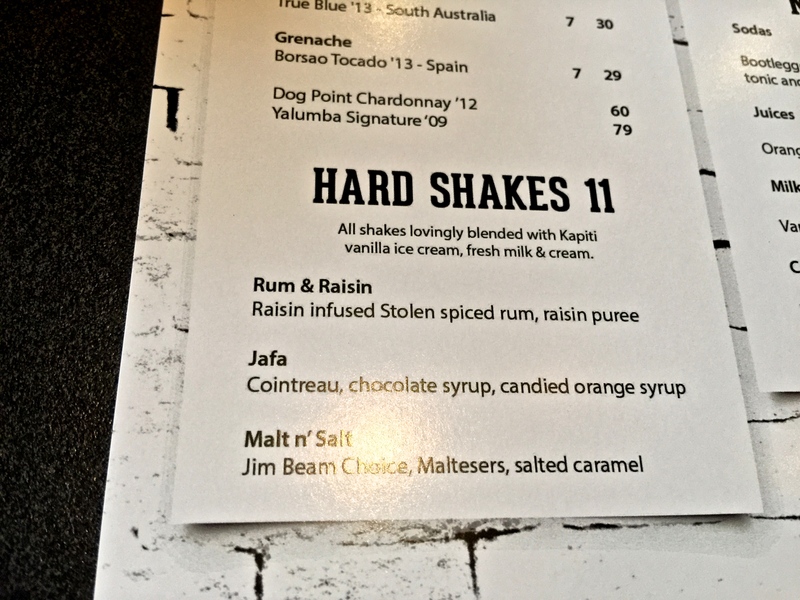 We enjoyed one of the ‘hard’ shakes (a’la Burger ‘Liquor’) – the Malt’n’Salt Jim Beam Choice, maltesers and salted caramel – which was made with Kapiti vanilla ice cream giving a pleasingly thick texture. Very moorish and a pleasant surprise. I noticed on the way out that they’re passing on the 2% credit card fees, and the bright blue exterior paint still doesn’t do it for me, however it was a pleasant eat overall and we’ll definitely be back sometime. Open every day from 11am. Named in honour of the Bethel Woods Centre for the Arts on the site of the Bethel Woodstock music festival in 1969. Fittingly with live music on Wednesday, Thursday and Friday nights (BBQ and Blues on Wednesdays). And part of the Williams Pub Group who have the Gasworks at Miramar, and Co-op at Whitby, among others (ergo the decor). 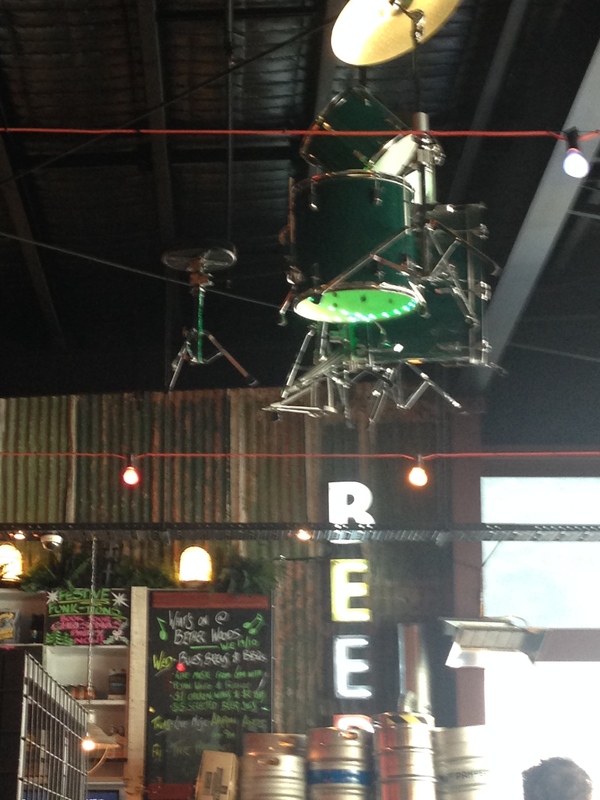 Check out the drum kit above your head on entry. Bethels have two imported meat smokers tucked on the rooftop and so not surprisingly the menu is fairly carnivorous. With a bit of bread. The lunch I had was delicious. 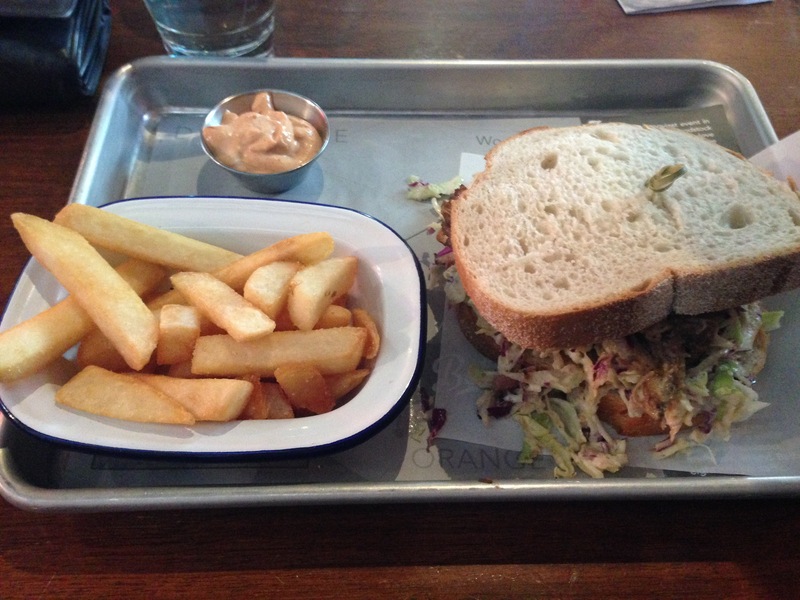 The pulled pork with fennel slaw and pickled apple sauce sandwich was sufficiently oozing and finger-licking good. Those who had salads were pretty impressed too. The dinner a few weeks later was a different experience with two musicians cracking through a range of slightly bluesy classics from the 60’s and 70’s and a much more swilling crowd. The sound level was pretty high (music and the swillers) so conversation consisted of a fair chunk of sign language, and you needed to be happy to bump shoulders with others or share tables (they were pretty great at making up a temporary trestle table for six of us to start with though, which was impressive). I didn’t mind the buzz. 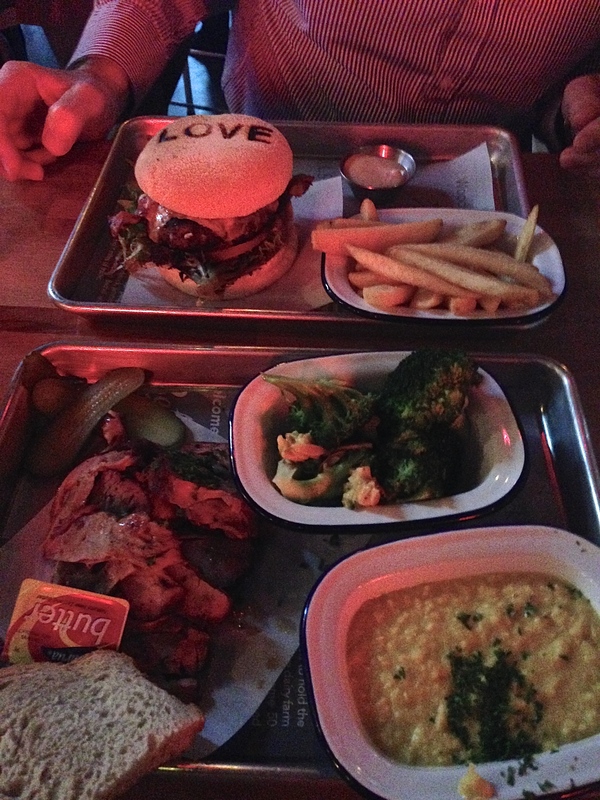 The beef burger got the big thumbs up, and the smoked meat from the BBQ pit (a choice of six varieties – I decided a bit of lamb shoulder was the go) with two sides was pleasant enough, if not strongly flavoured of itself (the smoky BBQ sauce added at the table soon smartened that up). The broccoli with almonds was very tasty. The sliders that someone had earlier looked like a winner too. Three different meats in the three sliders and decent sizes. I think they might be my next dish to try. And being Wednesday one could order any number of BBQ chicken wings (pretty large chickens) for $1 each or BBQ ribs (also dino sized) for $2 each. Some of the others took this up and declared themselves full for $8 (very paleo-compliant that combo!). They have Alan Scott wine on tap, a moderate range of wines and sodas by the glass and beers on tap or on the blackboard. Check out this Stuff article if you fancy a bit more background on their views about beer or The Terrace as a location. So in conclusion, you’d pretty much always have a good time here I think, and enjoy some fairly pleasant gastro-pub fare (much of which is handily finger-edible), but beware the noise and crowd factor if that’s not your thing. Lunch is a little more sedate. And I suspect brunch might be downright peaceful. Monday to Friday 7am to midnight. Saturday and Sunday 10am to 10pm. 73 The Terrace (the old Wine Loft premises).